Gold mining areas around Las Vegas are located in Clark County, and in nearby Mohave County. Clark County has not received much attention when compared to the more well-known mining areas of the state of Nevada, but there are still some decent opportunities here. Placer gold in Clark County can be found southeast of Las Vegas on U.S. Highway 95 near the historic mining town of Nelson. The El Dorado district is located in the Opal Mountains have produced gold since the mid 1850’s, both in lode and placer deposits. There are gravels in and around the El Dorado Canyon area where small amounts of placer gold have historically been found. They have also been found in bars along the Colorado River south of the Eldorado Canyon. Historically, gold production from the El Dorado Canyon area has been relatively small, and the bulk of the mining activity here took place during depression-era mining operations. The source of the gold at El Dorado Canyon is estimated to come from the lode mines near Nelson. Smaller prospects can be seen in and around this area most likely done by small-scale placer miners during the 1920’s and 1930’s. On the northern side of Lake Mead is the Gold Butte mining district. This area is northeast from Las Vegas on U.S. Interstate 15 towards Riverside. Most of the gold in this area is found either North of Lake Mead or South of the Virgin Mountains. More deposits are located further inland from the original shore of the Colorado River. The Searchlight District is located west of the Colorado River on the eastern side of the Newberry Mountains. The hills between the southern Eldorado Mountains and the northern Newberry Mountains are home to the gold mines of the Searchlight district. There are also deposits east of the main mining area between the Colorado River and Newberry Mountains. The source of the placer gold in this area is speculated to be the result of a similar type of deposit, which tends to contain gold, silver and heavy surface ores. 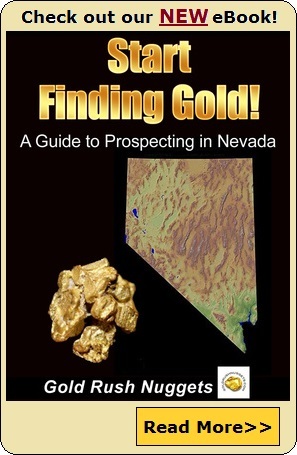 The most popular areas are the Gold Basin and Lost Basin placers, although there are many scattered gold deposits that can be found all throughout the county within a few hours of Las Vegas. The Gold Basin district comprises a hilly area in the eastern part of the White Hills. The area is accessible by road some 60 miles from the county seat of Kingman City. The gold deposits are mostly free milling, and were of the mesothermal vein type in pre-Cambrian granite and schist. Placer gold locations in Gold Basin are found in gold-bearing gravels arroyos and gulches on the large detrital fan that sloped eastward from the White Hills to Hualapai Wash and traversed by White Elephant Wash and its tributaries. The Lost Basin district is located within a small northward-trending group of mountains, locally known as the Lost Basin Range. This range elevates east of Hualapai Wash and is separated from the Grand Wash Cliffs by Grapevine Wash.
Placer gold locations in the area were found on the eastern and western sides of the Lost Basin Range, south of Lake Mead. On the western flank of the Lost Basin Range, placers found in Quaternary-age alluvial fans are still actively worked through small-scale mining. These placers occupied an area relative in size to the placer grounds on the east side of the range. 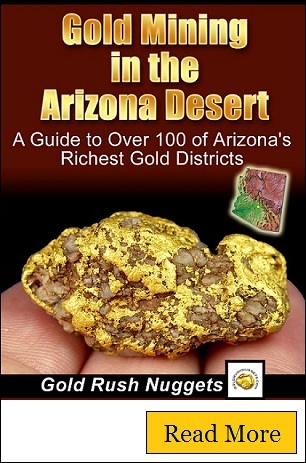 The richest lode gold mining area in Mohave County was the San Francisco and Oatman districts. Placer-gold production from this area has been small compared with lode production, despite the fact that placers have been worked since about 1865. The principal settlement of Oatman is 29 miles via the State Highway 66 from Kingman. From the highway, there are several roads leading to the various gold bearing areas in this region. Placers have been mined in the vicinity of some gold mines near Oatman and in the valley of Silver Creek, which drains northwest from the Oatman Camp. In the Oatman area, there were three small placers that were worked. Most were relatively small-scale. Furthermore, gold was also recovered in the stream gravel which overlies an irregular pediment formed on volcanic rocks from the valley of Silver Creek, about five miles northwest of Oatman. Learn More about the gold placers in Arizona and Nevada!